How Many Cubs Do Polar Bears Have at a Time? Although multiple births are the exception rather than the rule in human births, things are usually very different in the animal kingdom. The polar bear (Ursus maritimus) is a specific example of this. 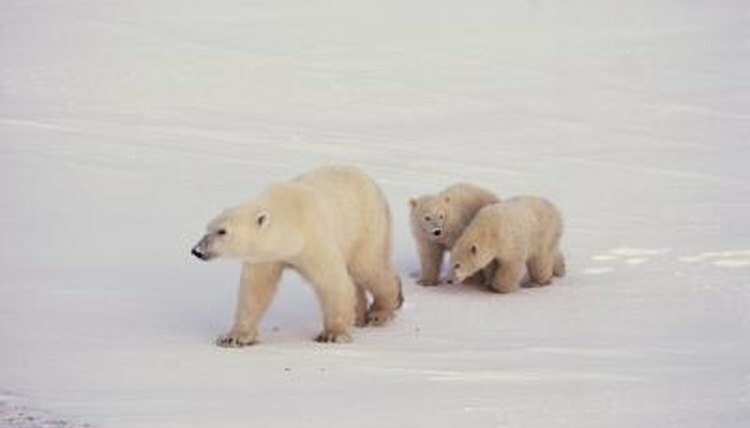 Female polar bears give birth to multiple youngsters more often than not, although single births also do sometimes occur. For polar bears, intervals between births usually are around three years. However, some polar bears have shorter intervals of two years instead. The typical gestational period for the species is roughly eight months. The breeding season begins towards the end of March and goes all the way into June each year. During mating, pairs of male and female polar bears generally remain alongside each other for approximately a week. In this time span, mating activities take place a handful of times. Polar bears generally give birth to between one and four wee cubs at a time, according to the Defenders of Wildlife organization. Two cubs or "twins" are the most common, followed by single births. Although litters of three or four cubs are indeed very possible, they are not as prevalent. Litters of four cubs are particularly uncommon. Litters of polar bear cubs usually enter the world during the months of November, December and January -- hibernation time. In the polar bear world, solely expectant females hibernate in the traditional sense of the word, meaning that they physically go inside of a den. Female polar bear hibernation is very light, as it is imperative for them to maintain more elevated body temperatures. Even while they're hibernating, they're responsible for nursing and caring for their little ones, and the duties of mothering can be very physically taxing. Whether a polar bear has one cub or four of them, they all start their lives out the same -- unable to see and hear. After roughly a month they start to see, and after about two months they can even walk around. Birth weight for polar bear cubs is usually approximately 1 pound. Body length is usually between 12 and 14 inches. With proper nursing from mom, these "little" guys are fast growers. When they finally emerge from their dens in the spring, they often weigh between 20 and 30 pounds. Polar bear mothers stay close to their offspring for a minimum of 20 months. During this time frame they show their cubs the vital skills they need to thrive as adults, including hunting techniques. How Old Should a Guinea Pig Be Weaned? Where Does a Ground Squirrel Go for Shelter? Do Boa Constrictors Give Birth to Live Young? How Does a Chinchilla Care for Its Young? How Long Are Mom Polar Bears Pregnant? How Long Do Orangutan Mothers Stay With Their Young? How Long Is a Groundhog Pregnant? Does the Dad Cheetah Stay With the Mom? How Old Does a Guinea Pig Have to Be to Leave Its Mom? What Do Baby Orangutans Look Like? How Long Does It Take for Hedgehogs to Give Birth? How Long Do Porcupines Stay With Their Mom? Do Male Guinea Pigs Need to Be Separated From the Piglets? How Often Do Sloths Reproduce?